When Zomorod Yousefzadeh and her family move (again), she decides to take the opportunity to start fresh and try to fit in with her new California schoolmates. The first thing to go? Her name. She adopts the classic Brady Bunch Cindy as her identity. After a rough start, she begins to find true friends. But when unrest in Iran turns into an American hostage crisis, Cindy begins to catch glimpses of an uglier side of the Land of the Free. Cruel bumper stickers and slogans send chilling messages to Cindy and her family. Cindy tries to protect her parents from some of the cruelty, and her friends try to encourage her that not everyone feels so negatively about Iranians. Ultimately, Cindy has to navigate her own way through the crisis and find the balance between devotion to her family, pride in her heritage, and the freedom to pursue her own individual identity. This is the story of a young Iranian girl in the United States during a time when anti-Iranian sentiments run high. Even though we’re talking about the late 1970s, much of the conflict and hate Cindy and her family faced made me think about the way Muslim families in the US are sometimes treated in the US today. The hate and fear-based unkindness were wrong then and are just as wrong now. While the exploration of American feeling toward Middle Easterners or Muslims is a heavy topic, it does not dominate the story. In fact, Cindy is a spitfire girl who’s determined to stay positive and help her family as much as she can. She’s funny and kind—one of my favorite parts of the story was her voice and way of describing things. It absolutely captured, for me, what it was like to be in middle school and the kinds of friendships I had. It made me want to call my own Carolyn and Howie (Cindy’s friends) and retell our own stories from those times. I loved this story for its own sake. I will always enjoy tales about an awkward middle school girl finding her people, discovering who she is and what really matters. At its core, that’s what Cindy’s story is, and her sense of humor and her compassionate heart make her an incredible heroine. Beyond that, though, I think we need narratives like this one. A young Middle Eastern girl is a girl like any other girl. This story reminds us to be angry that a girl and her family face prejudice for their nationality. It reminds us of the common bonds we share as human beings, of the value of the freedoms we have as Americans and the responsibility we have to use those freedoms to promote life, liberty and happiness in the lives of those around us. I definitely recommend this book. My daughter is ten and I really want us to read this book together this summer. The author has some great classroom resources listed on her web site, and information about the Falafel Kindness Project, a project that promotes creating a safe, bully-free environment for kids. Cindy and her family are non-practicing Muslims. At school, she’s friends with a Christian and a Jewish girl and there’s a brief conversation about how they worship the same God. While Americans are held hostage in Iran, Cindy’s family encounters hostility from neighbors and strangers. Someone leaves a dead hamster on the family’s doorstep. One man enters their house wearing a shirt that says “Wanted: Iranians for Target Practice.” Cindy briefly discusses the differences between American freedom and life in Iran, where the shah had protestors killed and free speech was a right guaranteed to the people. 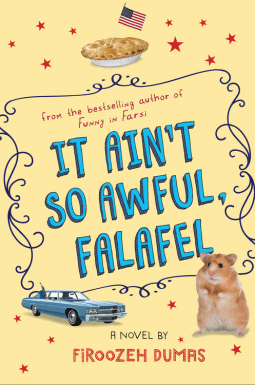 Tagged 1970s, Clarion Books, Firoozeh Dumas, Hostage Crisis, Iran, It Ain't So Awful Falafel, netgalley. Bookmark the permalink. This sounds like an amazing book. Thank you for sharing. Your reviews are forthright, wholesome, and enlightening. Keep it up!